Bitter Pills Zaman Muhammad H.
Auteur : Zaman Muhammad H.
Long the scourge of developing countries, fake pills are now increasingly common in the United States. The explosion of Internet commerce, coupled with globalization and increased pharmaceutical use has led to an unprecedented vulnerability in the U.S. drug supply. Today, an estimated 80% of our drugs are manufactured overseas, mostly in India and China. Every link along this supply chain offers an opportunity for counterfeiters, and increasingly, they are breaking in. In 2008, fake doses of the blood thinner Heparin killed 81 people worldwide and resulted in hundreds of severe allergic reactions in the United States. In 2012, a counterfeit version of the cancer drug Avastin, containing no active chemotherapy ingredient, was widely distributed in the United States. In early 2013, a drug trafficker named Francis Ortiz Gonzalez was sentenced to prison for distributing an assortment of counterfeit, Chinese-made pharmaceuticals across America. By the time he was arrested, he had already sold over 140,000 fake pills to customers. Even when the U.S. system works, as it mostly does, consumers are increasingly circumventing the safeguards. Skyrocketing health care costs in the U.S. have forced more Americans to become "medical tourists" seeking drugs, life-saving treatments and transplants abroad, sometimes in countries with rampant counterfeit drug problems and no FDA. Bitter Pills will heighten the public's awareness about counterfeit drugs, critically examine possible solutions, and help people protect themselves. 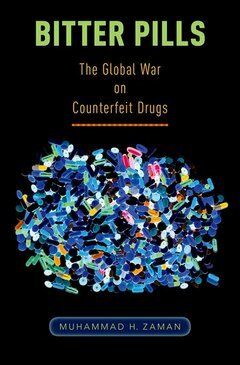 Author Muhammad H. Zaman pays special attention to the science and engineering behind both counterfeit and legitimate drugs, and the role of a "technological fix" for the fake drug problem. Increasingly, fake drugs affect us all.